We are a chief Exporter and Importer of Diamond Squaring Wheel in the market. It is used as a tool for correcting the uprightness of edges of a ceramic tile. Our Diamond Squaring Wheel is approved for fine up righting and sharpening effect. 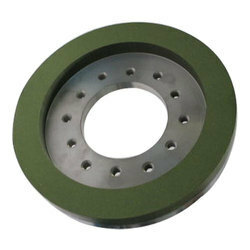 It is widely applicable in several ceramic and stone squaring machines. We are engrossed in Import and Supplier a wide range of Diamond Dry Squaring Wheel in Morbi, Gujarat, India. Our offered are developed by high quality material together with the use of advance tools and tackles at our vendors end. We assure the best quality products which are precisely verified by our quality team and provided at cost effective price range. 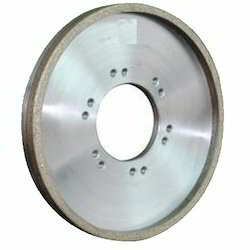 Diamond squaring wheels are mainly used for modifying the vertical. Diamond Squaring wheels are used for sizing Wall, Floor & Vitrified Tiles. They are avaible in Rough, MEdium & Fine Grits. The tools for correcting the uprightness of ceramic tile's four sides to get scheduled size, with the character of easy cutting, low noise, without chipping and smooth surface, etc. Available size 150mm to 300mm and customised size as per your specifications and drawings.